At the end of January, 1968, the Viet Cong and North Vietnamese launched an offensive throughout the entire country of South Vietnam. Every major city and every Provincial Capital was attacked. 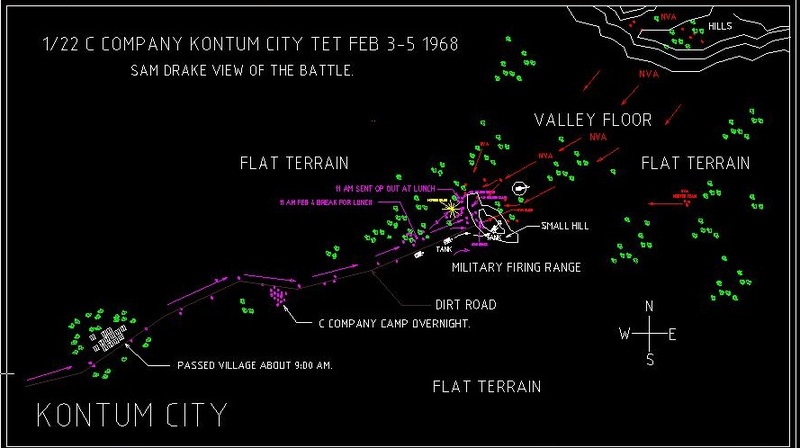 The attack on Kontum, the capital of Kontum Province, was initially hampered by elements of the South Vietnamese Army, who prevented the enemy from taking complete control of the city. However, during the attack, enemy forces managed to occupy large areas of the city and some of the outlying territory. The US Army force responsible for this area of operations was the 4th Infantry Division. Several units of the Division were tasked with clearing the enemy out of the city and pursuing him into the countryside. LTC William P. Junk, Commander of 1st Battalion, 22nd Infantry, was given ground command of the operation and was directed to assume command of all 4th Infantry Division forces in the area. For the duration of the operation the elements at his disposal were organized into Task Force 1-22. The ensuing 14 day battle became known as the Battle of Kontum. Had an unusual situation happen this past weekend. A guy who was in the guard tower at Kontum during TET sent me some pictures of the MACV compound and one after the battle. Thought you might like to post them on the C co site . He found me thru another military site about Vietnam and he was assigned to C company 43rd signal and was on the corner with the four towers. #4 was close to the withe brick fort next to MACV that housed the interrogation center during the fighting. His name is Jack Mahan and should get the credit for the pictures. The other pictures were taken by Charlie Company troops. My Sister’s father was killed in Kontum on April 15, 1968 also. His name was Richard Gunnar Anderson, from Wauconda, Illinois. We have no information about the battle or circumstances of his death. LOOKING FOR INFO ON PFC STEVEN R FRESE KILLED IN KONTUM PROVINCE SEPTEMBER 11 1968. Cousin Norman Keller (Doc) killed June 4, 1968, in vicinity of Kontum while serving with 2nd Battalion, 4th Infantry Div., 8th Infantry. A Medical corpsman. Spec. 4 Keller suffered a right arm Wound last march when a truck on which he was riding hit a road mine. Ethan, I’m pretty sure I knew him. If he later died from his wounds, it must be the same Jimmy R Thomas I knew. We got to the ambush site right after it happened. jkk@fltg.net if you want to talk about it. Finishing a book on Tet in the Central Highlands….interested in talking to anyone who was in Kontum, Pleiku, Phu Nhon, Plei Chorobo, Buon Ho or Ban Me Thuot during Tet 68. Charlie Company was in Kontum during TET 1968. So was A, B, D companies. I was with the 504th. m.p. co. We ran convoys 0n hy. 14 16. And 13. we had a town patrol in Kontum at the time of the first tet. It has very hairy. was with the 504 th. in kon tum at tet. Looking for info on a battle on a hill near Kontum. My dad was a Sergeant and was awarded a Silver Star during a battle on March 22, 1968. His name is Manuel “Sonny” Alvarez. He was acting 1st sergeant of Company C, 3rd Battalion (Airborne), 503rd Infantry, 173rd Airborne Brigade. I have no clue what all of that means. I did know your dad, but I think it was s.p. camp at dak-to. It mite be the battle of hamburger hill. It was hill 600 near Kontum. Anyone know Jerry Bolhofner wounded at kontum? My parents were there. My Dad was a twenty something year old Linguist and mother was an anthropologist at the time working at the Language center depicted in some of the photos above. My parents had been working with the Rengau people of the central highlands. (mountainyard people) I was there but not born quite yet. Our family is forever grateful for the help and support they received from those at the special forces base, MACV and those that fought in the battle at large. Hi Keri, Do you mean 1968? 1978 would have been after the war. He was killed 11/23/67. The 173d was heavily involved in the battle at Dak To and had heavy casualties. Read up on it if you want a sampling of hell on earth! My dad 1st Sgt Marion Manning was there. D Company of the 22nd. He did what he had to do in order to save as many as he could.